For many years, NVIDIA has offered “Game Ready” GeForce drivers to those who waste no time jumping on the newest PC titles. With day-one support, gamers can expect the best performance, and sometimes the enabling of special features, such as the screenshot tool Ansel. As an example, Battlefield V‘s launch was greeted by a Game Ready driver. Typically, multiple Game Ready drivers are released each month. Today, goals of Game Ready drivers are being carried over to brand-new “Creator Ready” drivers. As with the gaming counterpart, the Creator Ready drivers are designed to offer day-one support for the latest software NVIDIA’s GeForce, TITAN, and Quadro ProViz customers use. Once Adobe releases Premiere Pro CC 2020, for example (and only an example, since Adobe hasn’t announced it yet), we can expect to see a Creator Ready driver supporting it in full. The main difference between a typical GeForce driver and a Creator Ready one is that the latter goes through specific, thorough testing of the creative applications it supports. Performance isn’t the only thing that matters here. Stability is arguably of utmost importance, while general compatibility with new features is, as well. 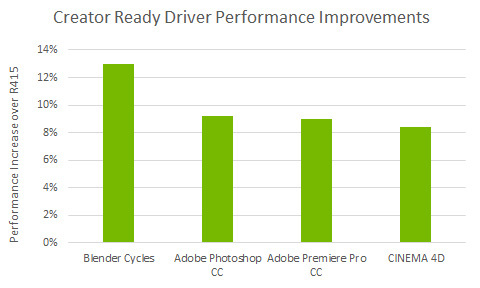 These Creator Ready drivers will not only focus on cutting-edge applications, but ensure that years-old versions some folks are still using will be supported as well (eg: Premiere Pro CC 2016). Stability is something that needs to be specifically called out here. Today’s creative users typically don’t stick to a single application, which means they could be juggling any number of them at any given time. This kind of workflow is exactly what Creator Ready drivers will optimize for. You will have the assurance that you can work as you need to without graphics quirks getting in your way. The Creator Ready driver also includes the typical featureset of the GeForce driver, including per-title optimizations – although it may not always have the absolute latest. Creative applications are the priority here, but you will simply not be losing any general gaming performance by opting for the creative driver over the gaming one. 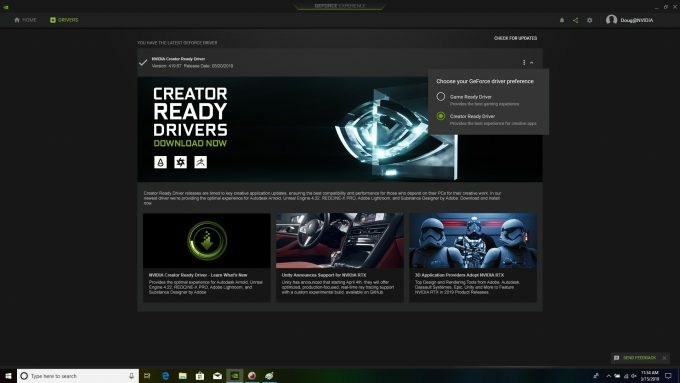 As seen in the screenshot at the top, GeForce Experience will allow users to choose between the Game Ready or Creator Ready driver, and while we’ve never known GFE to run on Quadro, these creative drivers support the same stack that the actual Quadro driver does. For quite some time, GeForce drivers have been able to handle Quadro GPUs no problem, but the Creator Ready driver is even more all-encompassing. Supported GPUs include Pascal and Turing-based GeForce, the TITAN series (including TITAN V), as well as Quadro. 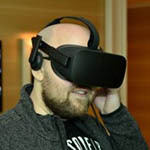 Newly supported applications in this release include Arnold GPU (more info from us here) for Autodesk Maya and 3ds Max, Epic’s Unreal Engine 4, RED’s REDCINE-X PRO, as well as Adobe’s Photoshop Lightroom CC and Substance Designer (Adobe acquired Allegorithmic in January). Naturally, NVIDIA boosted Blender performance mere weeks after our in-depth look at that very thing. We’ll revisit once Blender 2.8 launches. Performance called out here is Cycles-specific, but it seems likely that Eevee would also see a performance boost (even though it’s already fast as heck). You can grab the new driver here. If you want to provide feedback to NVIDIA, it welcomes you to head on over to its official forums.